FILE - Residents shop for fruits and vegetables at a market in Baghdad's Karrada district. Iraq relies on imports from neighbors like Iran, Syria and Turkey for much of its consumer goods. Iraq has begun to apply new U.S. economic sanctions against Iran, turning back shipments of Iranian goods at a number of border crossings, according to Al Hurra TV, quoting Iranian merchants. Iraqi Prime Minister Haider al-Abadi, who is straddling the political fence as he seeks a second term following parliamentary elections in May, told journalists Wednesday that he was "totally opposed to the principle of sanctions, given the price [Baghdad] itself had paid for international sanctions [under Saddam Hussein]." FILE - Iraq's Prime Minister Haider al-Abadi delivers a speech at an economic development conference in Tokyo, April 5, 2018. 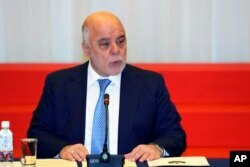 Nonetheless, Abadi said he would apply them, since "the world does business in dollars and it would hurt the interests of the Iraqi people" if he ignored them. Iran is Iraq's second-largest trading partner after Turkey, causing concern that strict implementation of sanctions could hurt the economies of both countries. Iraq imported more than $6.5 billion in goods and services from Iran last year, including consumer goods, building materials, raw materials, natural gas and electricity. Washington-based Gulf analyst Theodore Karasik told VOA that applying the sanctions would be difficult at various levels, especially for "Kurdish factions which are close to Tehran," which he said "would probably have a difficult time implementing the sanctions, and could ignore or work around them." He added that many Kurds have family ties on both sides of the border, making strict sanctions enforcement more difficult "because the family comes first and not the state." Veteran Saudi analyst and commentator Jamal Khashoggi told VOA that Iraq's Abadi "must maintain good relations with both the U.S. and Iran in order to remain in power." He joked that Abadi "probably has breakfast with the Americans and lunch with the Iranians," and most likely was "telling the Americans that he will respect the sanctions," while claiming to the Iranians that he "is obliged to say that." 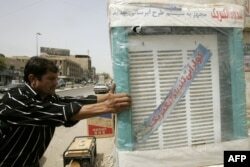 FILE - An Iraqi merchant receives a delivery of Iranian-made air coolers, at his shop in central Baghdad. Khashoggi said many regional states find themselves in the same dilemma as Iraq. "They are a friend to America and don't want to be on the wrong side of Donald Trump, but they want to maintain their economic relationship with the Iranians," he said. Khashoggi said that "Qatar, the UAE and Turkey, along with Oman and India, have the same problem as Iraq, so Donald Trump's decision to impose the sanctions is going to have a major impact throughout the Middle East." Political science professor Hilal Khashan, who teaches at the American University of Beirut, said Iraq has been trying to reach out to its Sunni Gulf state neighbors in order to diversify its strategic relations. He noted that Iraqi delegations approached both Saudi Arabia and Kuwait recently, "and there was talk about linking the Iraqi electricity network to the Gulf Cooperation Council grid, via Kuwait." Khashan said the Saudis were noncommittal "because they do not completely trust the Iraqi government or Abadi." Moreover, he posited that even if they wanted to "open up to Iraq," the Iranians would "probably not allow them to go very far." Khashoggi said the Saudis, nevertheless, are "interested in improving the relationship with Iraq," which he said "has improved in recent times." He said Saudi Crown Prince Mohammed bin Salman began to open up to Iraq "two years ago, and continued along that path, with some hiccups, here and there." By maintaining dialogue with Iraq, Khashoggi said, "Saudi Arabia is hoping that it could weaken Iranian influence in Iraq." "That type of pressure on Baghdad must be carefully calibrated because of the economic relationship between the two countries, so that Iraq's economy doesn't suffer at a time when it needs to be boosted," he said.